Amy Curry is having a terrible year. Her mother has decided to move all the way across the country and needs Amy to drive their car from California to the East Coast. There's just one problem: since the death of her father, Amy hasn't been able to get behind the wheel of a car. Enter Roger, the son of an old family friend, who turns out to be unexpectedly cute...and dealing with some baggage of his own. Meeting new people and coming to terms with her father's death were not part of Amy's plans for the road trip. But then neither was driving on the Loneliest Road in America, seeing the Colorado Mountains, visiting diners, dingy motels and Graceland. But as they drive, and she grows closer to Roger, Amy finds that the people you least expected are the ones you need the most - - and that sometimes you have to get lost in order to find your way home. People have been telling me for a long time that I'd love this book. I drove across the country--by myself-- in the fall of 2007 and it was awesome! I wished I had taken longer now. I was kind of in a race with myself how fast I could do it. I wish I'd at least have taken one more day and many more pictures. There is a lot to see! So, I was hoping that I'd really love this book. I'll be honest, it was a little heavy for me. I was expecting something really light and fun. What I got was a girl grieving over the death of her father and a boy trying to get over his ex-girlfriend. I wanted something more up tempo. This is not to say that many parts in the book aren't fun, because they are. 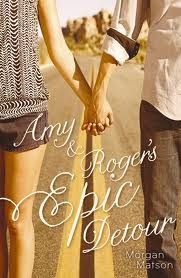 But, I felt like Amy and Roger were just passengers on the trip instead of experiencing what the American culture had to offer. They didn't drive on Route 66, or go to New York City! Maybe those are too predictable, but they are staples one would think for a road trip across the country. There are pictures though! Which I really loved. It was great to see those little tid bits and they added a lot to the story. Makes me want to drive across the country again! The love story didn't happen until the very end. I really didn't know what either of them were thinking or what they wanted to happen until then either. I wasn't sure if they were exhibiting the signs of likeability toward one another. It was nice to see then ending, but I'm not going to lie--I wanted much more from them. Overall, it was good. A bit heavy in places and I found myself wanting to skip over those parts and get back to the open road and what I might find there. I wanted more from the love story, but I'm happy how it ended up, I just wanted more. If you like road trip books or are thinking about going on a trip yourself, you should read this book. It might give you a few pointers on where to go! "It’s not about the destination. It’s getting there that’s the good part. " I've heard so much about this book, will definitely give it a try!